In Jayapura today, what should have been a celebratory occasion to mark the 10th anniversary of the West Papua National Committee, or Komite Nasional Papua Barat (KNPB), quickly turned into an all too familiar scene of Indonesian police forces beating and arresting peacefully gathered civilians. According to a KNPB report, as speakers were about to start their anniversary event, heavily armed policemen entered by kicking in a door. Police presented no warrant. They immediately began vandalising KNPB property and dismantled the gathering by arresting those in attendance. Markus Haluk at KNPB’s 10th Anniversary. just moments before he was scheduled to speak at the event. Among the attendees arrested was Markus Haluk, Executive Director of the United Liberation Movement for West Papua (ULMWP). The unofficial count of arrested KNPB members is currently at 112. Eyewitnesses also report at least two beatings of volunteers who were cooking food. Those arrested were transported to police stations. Their current legal status, or news of their safety, is unknown at this time. 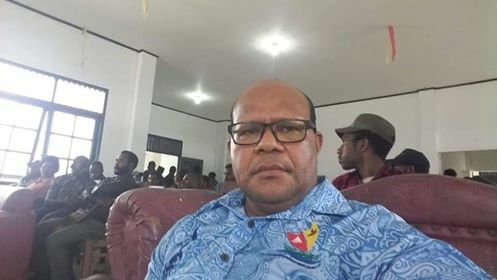 Since the group’s formation in 2010 the KNPB has grown to mobilise hundreds of thousands of West Papuans in every region of West Papua. Despite the Indonesian government’s routine arbitrary arrests, torture, and constant suppression of their fundamental rights to free speech and peaceful assembly, KNPB members remain committed to achieving their independence through peaceful means and dignity. 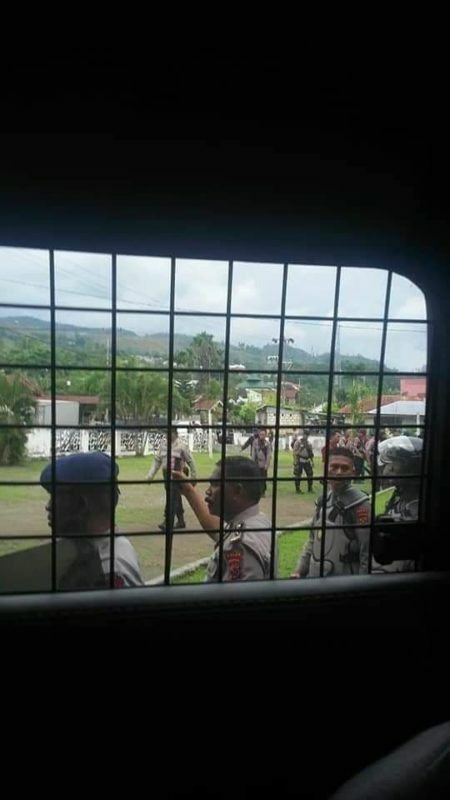 The view of an arrested KNPB member awaiting transport from inside an Indonesian police vehicle.